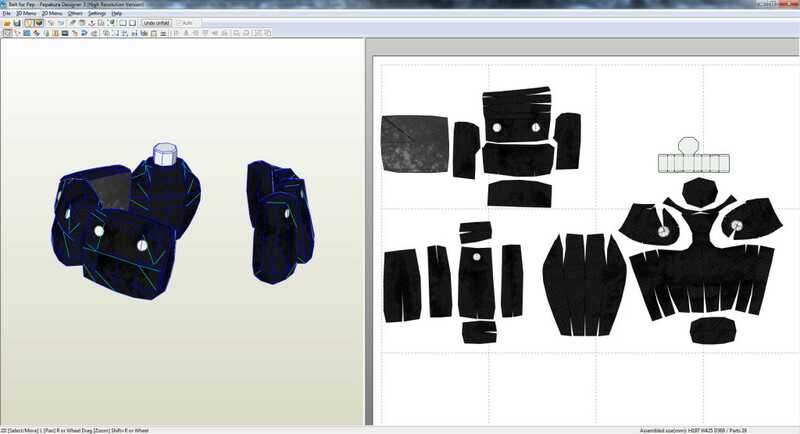 Extracted Belt Pouches in Pepakura Designer. These will be used to make the final patterns in Adobe Illustrator. 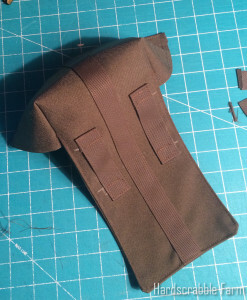 I looked at a lot of “real” military pouches to come up with my design. I didn’t want to have to buy a lot of custom binding fabrics, etc. At the most simple, these can be put together with just the fabric and a snap/buckle. 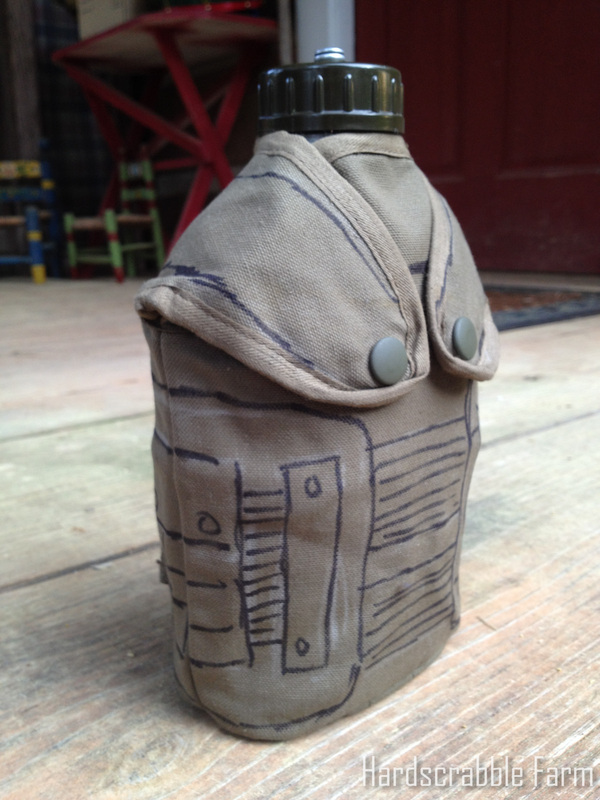 Once you master the basics, you can add all sorts of cool details to the pouches. 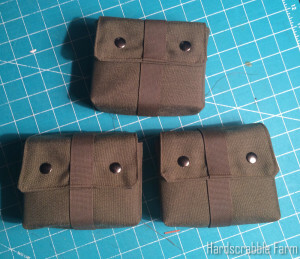 The photo above shows four of the finished pouches next to the USGI grenade pouch I LOOSELY based my design on. The USGI patch is made from a single layer of multicam camouflage cordura, and the edge of the flap & pouch opening are bound with coyote tan colored ribbon. 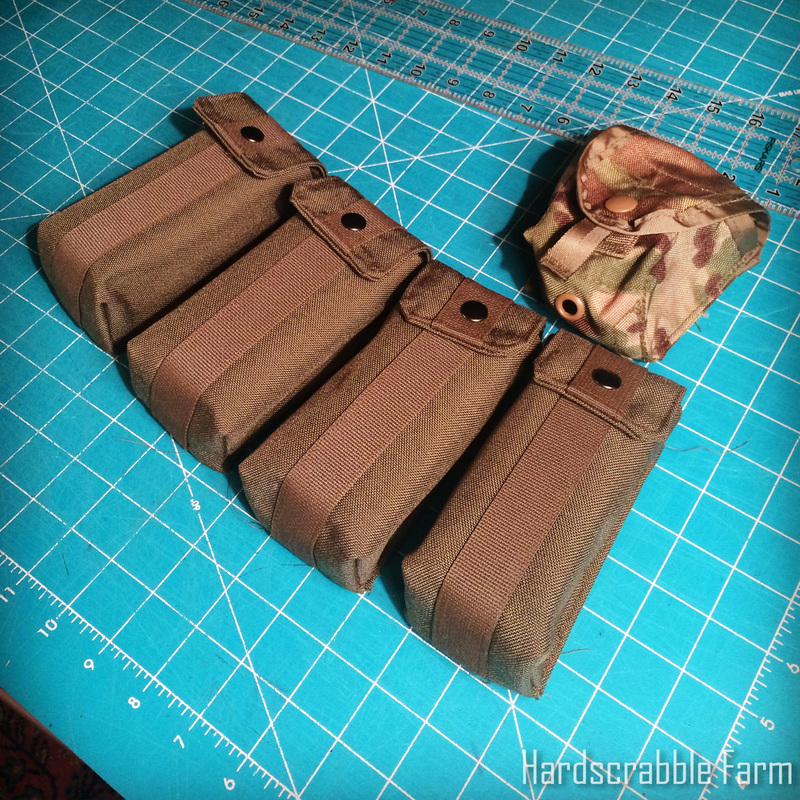 The main cosmetic difference between the USGI & Fallout pouches is that the edge is not bound with ribbon in Fallout. It’s just got a stitched edge. 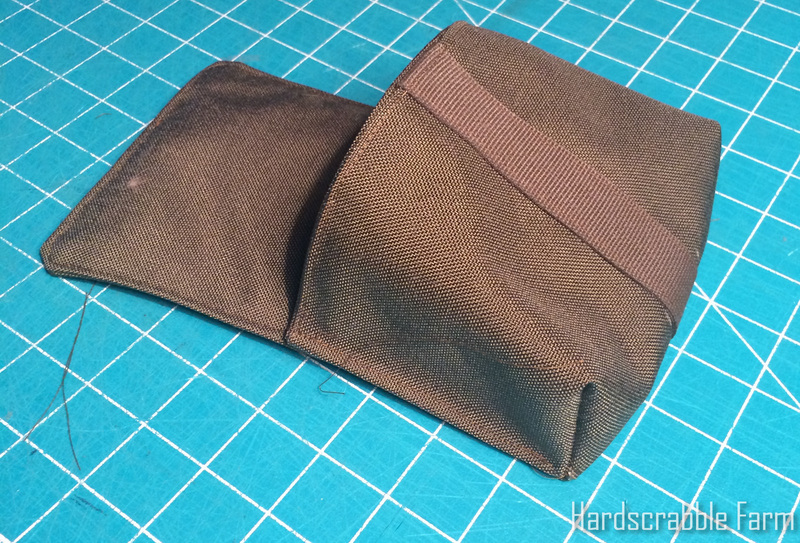 Because of this, I decided to go with a pouch made from two layers of fabric. 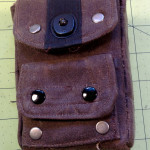 The fabric came from Rockywoods Fabrics and the fasteners came from Tandy Leather. 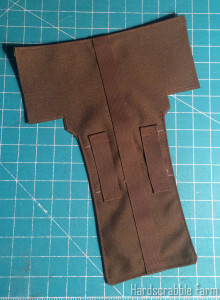 The 1″ webbing is used for the belt loops and the strip down the center of the pouches. 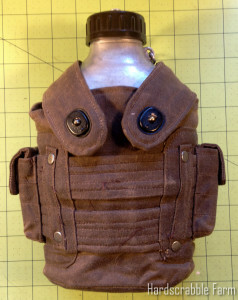 The 2″ webbing was used for the belt loops on the canteen cover. The first step is obviously to cut & trace the pattern. The outer dotted line on the pattern is where you will cut. This is the outer edge of the pattern piece. I’ve accounted for a 1/2″ seam allowance, so the solid line 1/2″ inside the pouch will be the finished size. You will need to trace/cut two of these pieces per pouch. Do NOT cut out holes where the pattern shows the belt loops. Those are only location marks to help you align the belt! You will have to widen/narrow this mark based on the belt you will be wearing. One trick I did learn is to extend the pattern line past any intersection. This allows you to see where an edge ends, even if the edge is covered by your metal straightedge. 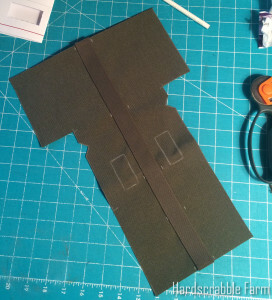 Now you will apply the webbing strap to the Right(Front) side of one of your two pattern pieces. You’ll probably want to draw alignment marks in chalk so you’re sure it’s centered. 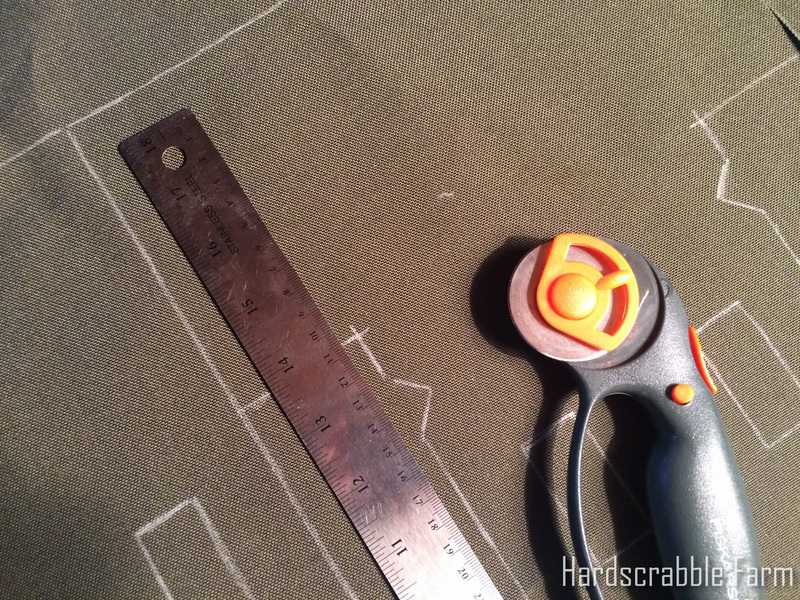 You’ll just sew around the perimeter of the webbing…about 1/8″ from the edge. You’ll then place the right sides (side of the fabric that will show) together. You’ll sew along the edged marked A/B/C/D on the pattern. Those edges are marked in red on the photo above. Clip the extra fabric from the bottom two corners, but be sure not to cut the stitching. This will keep you from getting a bump/lump in the corner of the flap. Now you’ll flip the pouch so the right side of the fabric is outside. You can now iron the pouch flat. That will make it easier to stitch close to the edge of the fabric. You’ll stitch around the entire perimeter of the pouch. this will give the pouch flap & opening a finished edge, abut also make it easier to sew the side & bottom seams. The next step is to stitch the belt loops on. 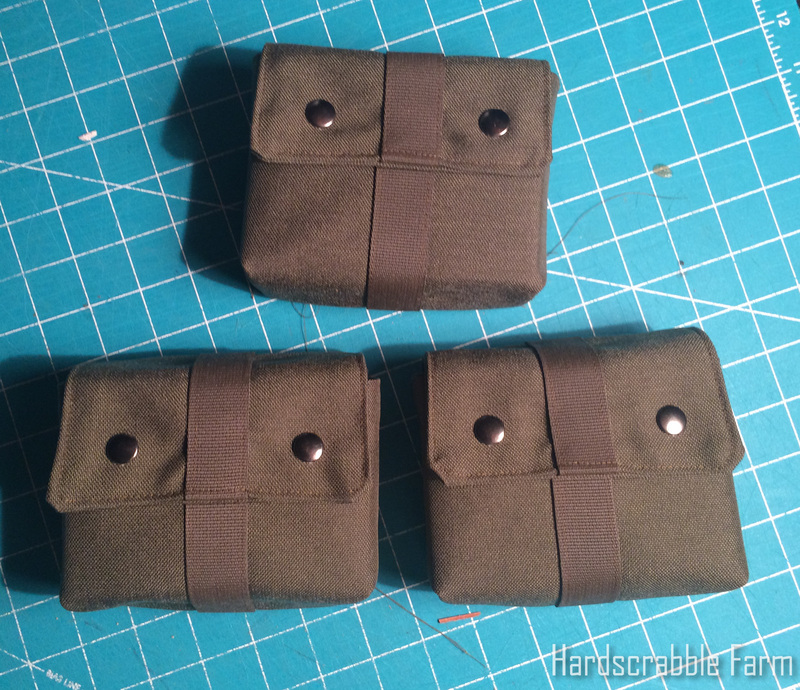 I opted for two 1″ belt loops set wide apart on the wide pouches. 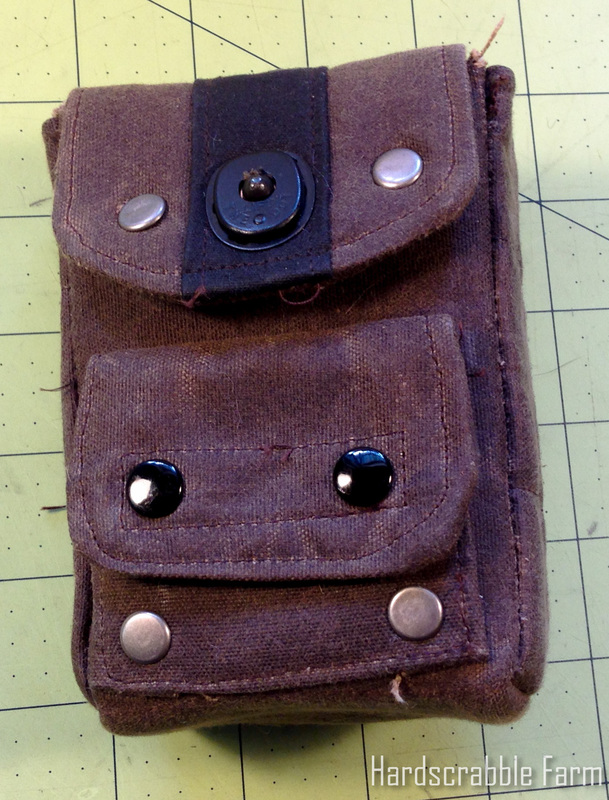 You could go with a single 2″ loop at the center, but your pouch may twist on your belt. Make sure to cut the webbing long enough so you can flip the raw edge under where you’re stitching the top/bottom of the belt loops. 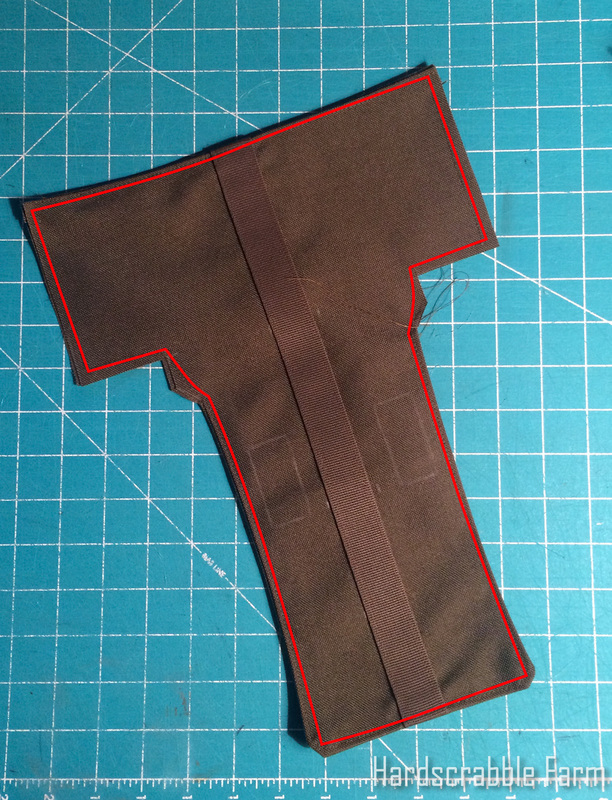 You’ll now fold the right sides (outside) of the side edge to the bottom edge. 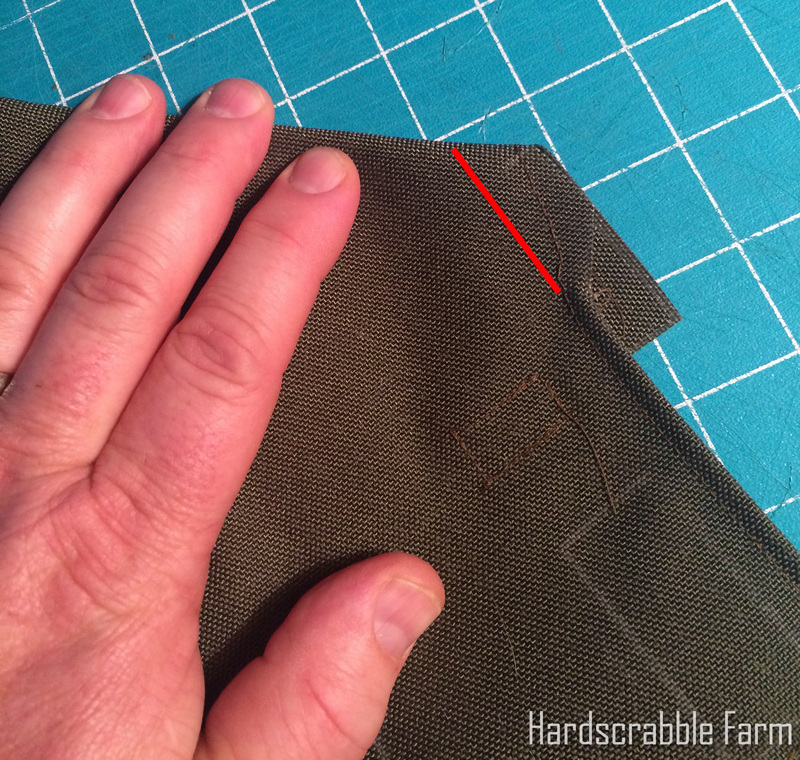 Make sure to align the edges of the seam allowance. The photo above shows where you’ll be stitching. It’s basically along the trapezoid formed by the seam allowance. You can now turn the bottom edge seam right side out & it should look like the photo above. 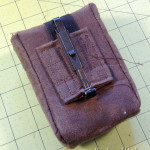 Now you’ll be stitching the back edges of the pouch to the side. You’ll fold the side seam allowance in, then pinch the folded side edge to the back edge of the pouch. The photo above shows where you will stitch the side to the back. 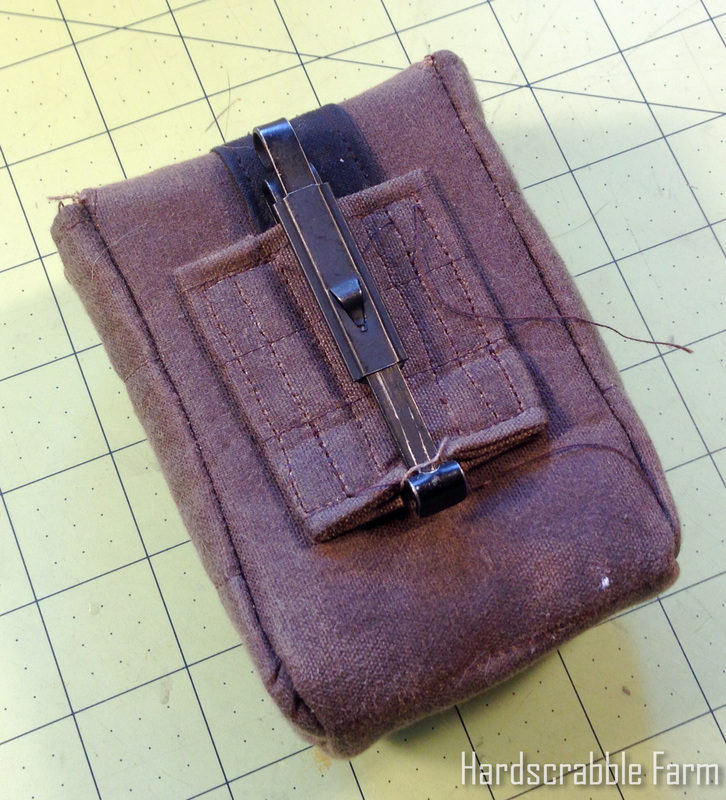 Note: Make sure to bar tack where the top edge of the pouch meets the side. 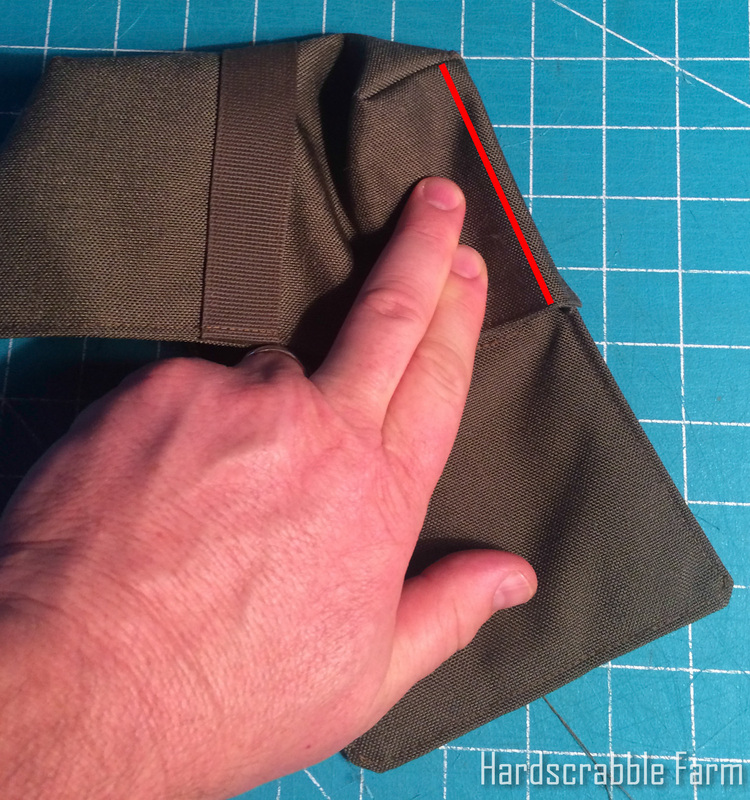 That will keep the pouch from splitting when you add weight to the pocket. The photo above shows the final side seam. Option: If you want a crisper front side or front bottom seam, you can pinch the fabric together & top stitch a pucker to the edge. The last step is to add the snaps. 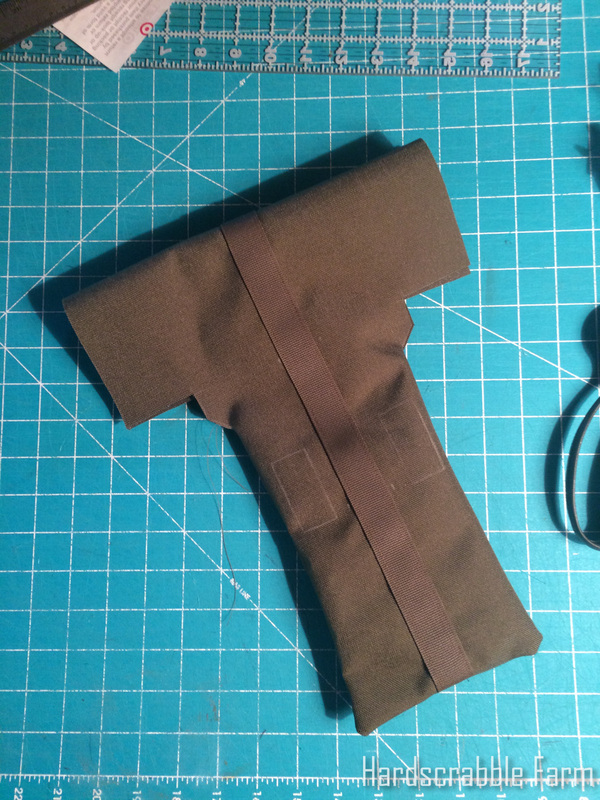 The Fallout pouches use one snap for the narrow pouches & two snaps for the wide pouches. 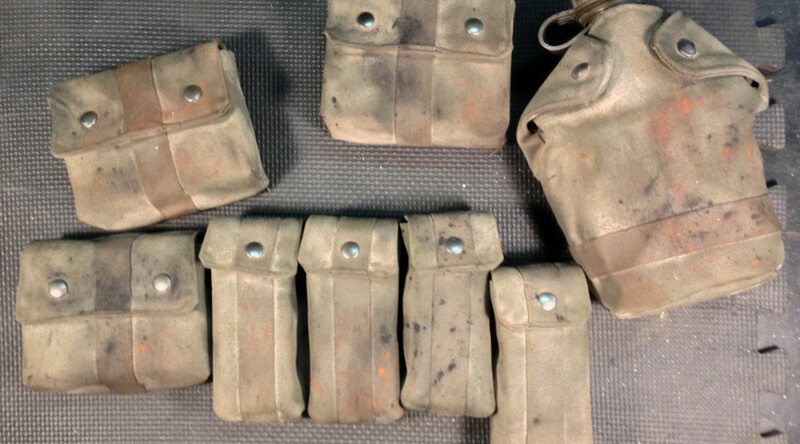 These are the final pouches before weathering. This also shows the canteen cover. 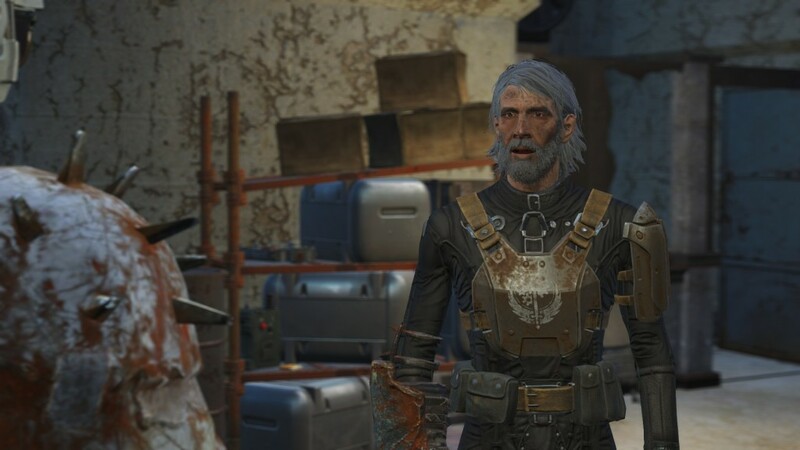 Honestly, I didn’t include the canteen pattern because once you’ve put together all the ammo pouches, making your own pattern for your canteen should be fairly simple. That pattern will also be unique to the canteen you choose for your belt. I have made the pattern somewhat universal. There are dotted lines to allow you to easily adjust the size of the pattern to your own needs. You can adjust the sizing by adjusting the pattern along the Purple, Blue, Green, or Orange dotted lines. Some adjustments require you to add/subtract from more than one part of the pattern. 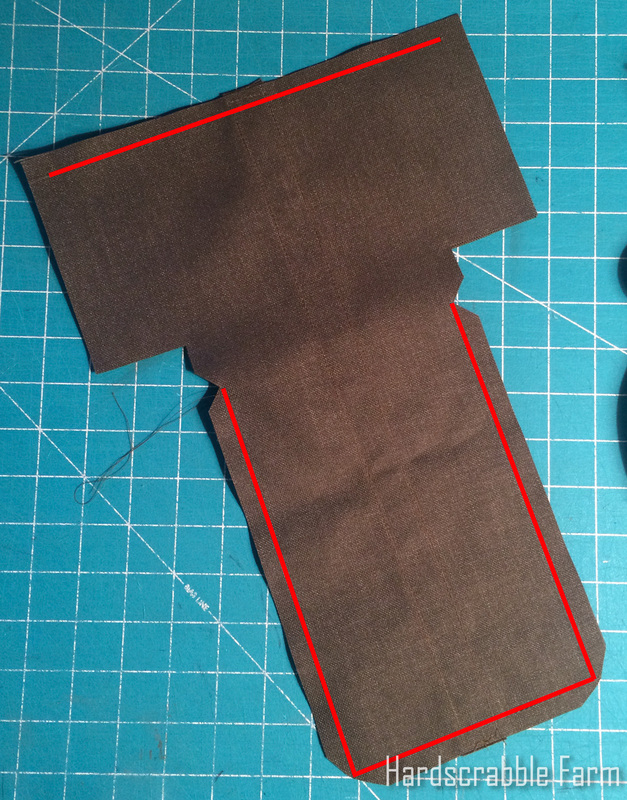 For instance, to make the pouch taller/shorter, you have to cut the pattern in two places. 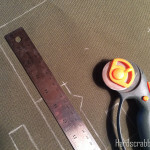 Making it deeper or thinner requires you to cut the pattern in four places. Click the image below to download the .PDF pattern. This pattern will print on 6 pieces of 8-1/2″ x 11″ paper. In the Adobe Acrobat Print dialog box, under page Sizing & Handling, choose the Poster button. 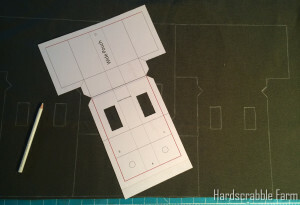 That will allow you to print the 100% scale pattern tiled across the 6 pages. I’ve included a 1″ x 1″ square so you can verify that it printed correctly. 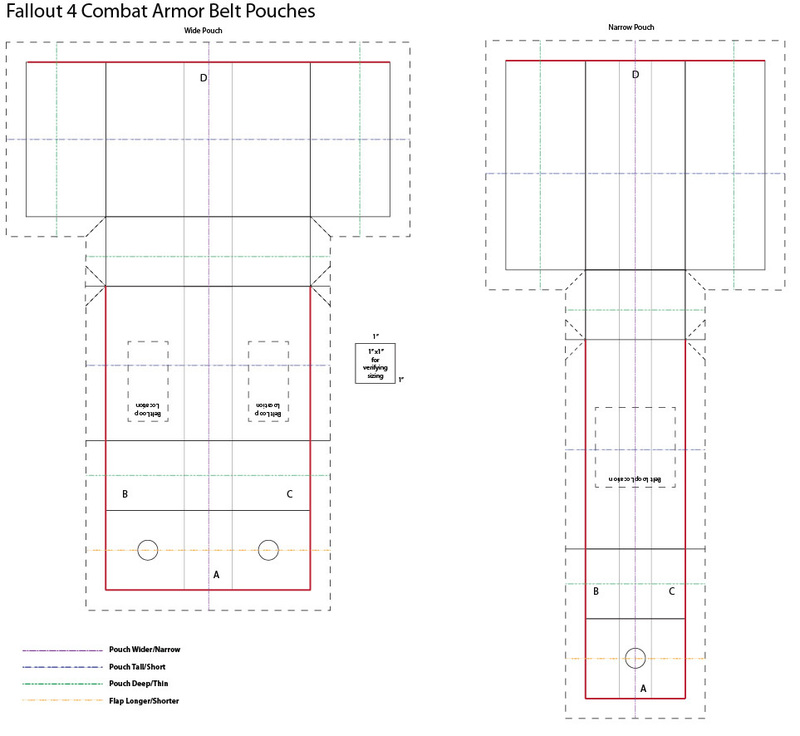 Click this image to download the Combat Armor Belt Pouch .PDF pattern. Options for other styles of pouches. Alice clips are a great solution if you’re using a USGI web belt. You can pick them up from a military surplus store for about $1 each. These make it very easy to swap out pouches without having to remove all the other pouches from your belt. I don’t think you would want to use these with leather belts. I would imagine they would leave marks in the top edge & may damage the leather. The photo above is from my Gears of War Marcus Fenix belt. 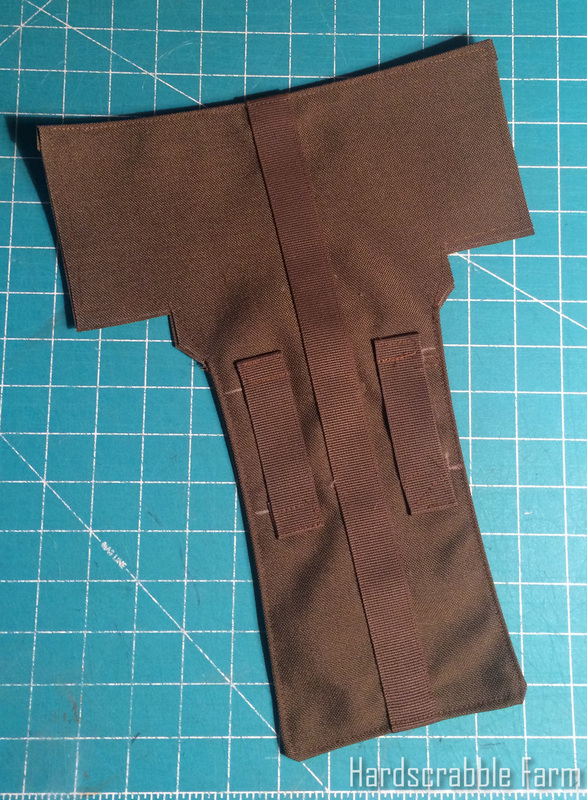 I used a folded over panel of fabric to secure the alice clip, but you could also use a wide piece of webbing. This Gears of War pouch has extra rivets on the flap, a small pouch on the face, and uses Mil Spec “Lift-The-Dot” closures. You can find the Lift-The-Dot closures, along with other WW2 Mil Spec hardware on At The Front‘s website. Just go to the Fabric & Hardware > U.S. Hardware section of their site. French 1-1/2 quart canteen with design drawn on it. It’s kinda hard to explain without photos so I may do a blog post about canteen covers later. 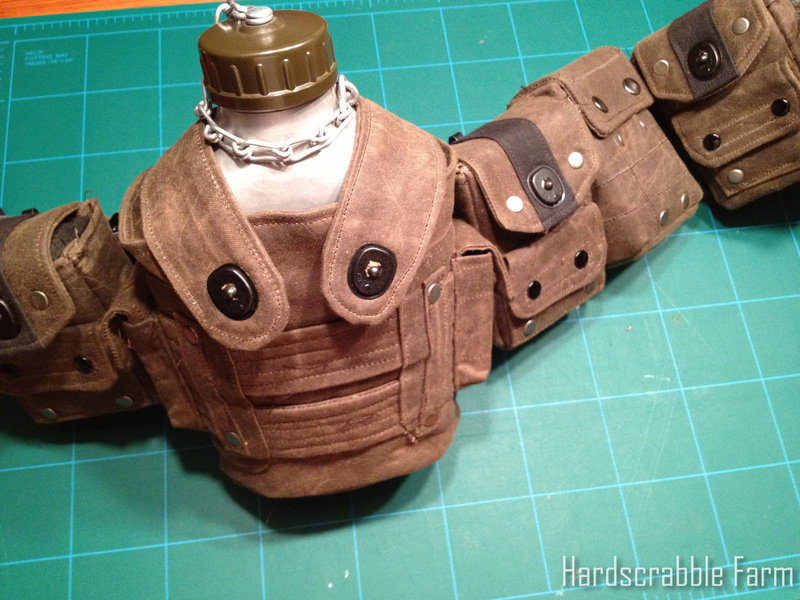 Finished Gears of War 3 Marcus Fenix canteen cover. Gears of War 3 Marcus Fenix belt pouches. 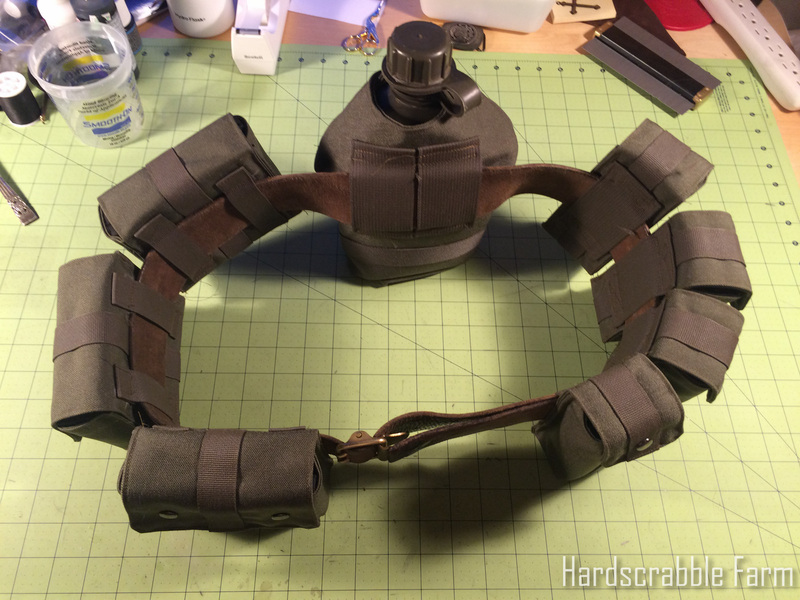 The photo above shows all the Gears of War belt pouches on the belt. The pouch two to the left of the canteen is quilted. You can achieve this by using heavy interfacing between the two layers of pouch fabric. Then, after you’ve flipped them right side out, you can stitch the quilt pattern into the pouch.